People with physical impairments, ranging from the loss of sight to the loss of a leg, face hurdles that most of us don't even consider. Fortunately, as technology makes life easier for everyone. I love the scooter the jazzy type makes me feel more handicapped than I already am.I have Muscular dystrophy and mutiple sclerosis. Medicaid will not buy me a new wheel chair I need both a chair& scooter. Technology properly used is the greatest of blessings. In the hands of the greedy it is destruction. 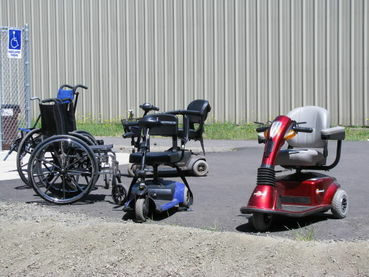 What a wonderful way for handicapped people to increase their mobility! Having gone to school with disabled people and knowing some all my life, i find this story very interesting. Thank you for posting it. I have a petition on Care2 asking the government to establish a Buearu of Disabled Affairs. Please sign it. Thank you. Really cool, Olivia. Thanks for sharing. It's getting better all the time, whether it's co-ordinated JAWS and Dragon NaturallySpeaking on a computer, portable voice-enhancement or artificial vision devices getting easier to use, or that Starship Troopers inspired walking exoskeleton. Whether it's Roosevelt on his crutches, Keller and Sullivan learning about each other, Hawking dreaming the multiverse from a power chair, or my neighbour the blind novelist, we're all seeing more and more that loss of a major sense isn't loss of the person underneath. Good these items make life easier for the physically impaired. I am sure more items are being developed. This is so great! Disabled people can have their freedom to be somewhat half way normal and not be caged at home cause they have no way to get around physically. Now if they could make RAMPS everywhere for disabled people in businesses as well as apartments, they would be treated just as equal as those who aren't disabled. Too many places lack Ramps and disabled parking. Very clever my colourblind cousin has a great app on his phone that shows colours so he can teach his (thankfully not colourblind) son all about them. Although I am getting very sick of those electronic scooters being used by morbidly obese people, here in Australia the government sometimes gives rebates on mobility devices which is great except when people who need nothing but being forced to get up and walk are given huge expensive scooters payed by my taxes. There not disabled just lazy! Unfortunately one needs a all-purpose vehicle to transport those scooters, motorized chairs and the like as they can not be folded like a manual chair... ergo, they will not fit into a normal family car boot...if one lives close to shopping areas etc, they would be a God-send way of getting around and being more independent...but, alas, we don't all live close enough to such amenities and therefore still need someone to transport us to our destination....and yes, ramps are not everywhere...so, how to get in...??? Great help for persons with disabilities! This is GREAT for people that have disabilities. It's about time that more is being done to help them to be able to do things that they where not able to do before.